This butternut squash took about half an hour to peel. It was a b**ch, but I persevered. In the end it was so worth it. The slices that are half moons could be cut out with small biscuit cutters into smaller half moons if you want. I didn’t think about it until afterward. 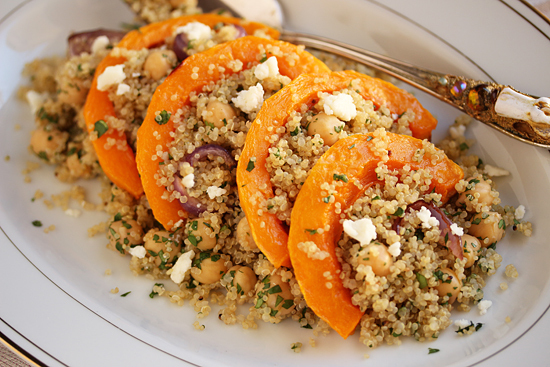 If you are serving separate plated salads, this dish would be really pretty and a lovely start to your feast. I usually serve the soup and salad first, and then send around the turkey and the rest of the feast family style on platters. I am thinking about a corn bisque for my soup course, so stay tuned. Yea for the Happy Holidays! 1. Preheat oven to 425 degrees F. Line baking sheet with aluminum foil. Spread 1 tablespoon olive oil to coat sheet. 2. Bring the 2 cups water to boil in 2 qt saucepan. Add 1 cup quinoa, bring back to boil, cover, cook over medium-low heat for about 12 minutes or until quinoa has absorbed all water. Remove from heat, fluff, cover and let stand for 15 minutes. Set aside. 3. 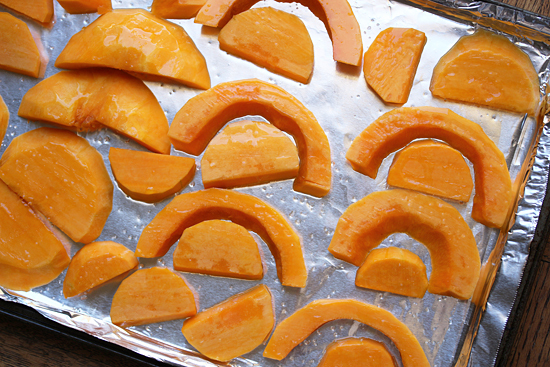 Place butternut squash slices on baking sheet and turn to coat with oil. Roast for 10 minutes. 4. Turn squash slices over and add onion wedges. Drizzle onion with remainder of olive oil. Roast for 10-15 more minutes, or until squash is tender and onions are browning on edges. 4. In a large bowl, mix together the vinegar, sugar, minced cilantro, chickpeas and cooked quinoa. Mound on serving platter or individual salad plates. 5. 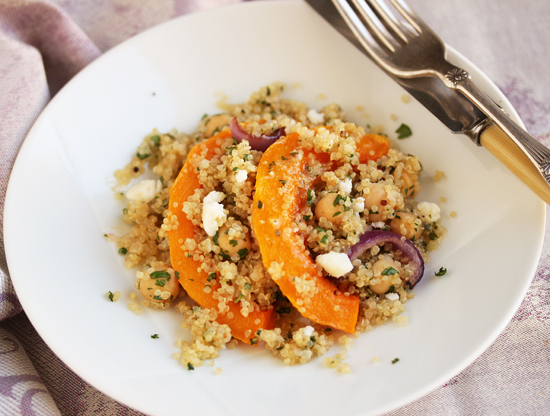 Top quinoa mixture with onion, butternut squash slices and crumbled cheese. Drizzle with half of Lemon Honey Vinaigrette (or more, to taste). Pass remainder of vinaigrette at table. 1. Place vinaigrette ingredients in small bowl and whisk to emulsify. Copyright © 2010-2011 Cook & Be Merry. All rights reserved.